Adam Satrom reaches a gloved hand toward the ranks of empty beer cans waiting beside him. Checking for tiny defects that could spoil a good seal, he sets four, six, eight cans on his mobile canning machine. They jostle into a row down the conveyor belt as he tosses away the rare discard. Satrom is part of a two-man team that just arrived in Humboldt after a wine-canning run in Oregon. Now The Can Van crew will spend two days in Blue Lake, canning about 36,000 gallons of Mad River Brewing Co.'s Steelhead Extra Pale Ale. As they work, bluegrass music twangs in the background, then switches to a thumping reggae. The scent of fresh beer wafts from the final, foam-flecked phase of canning. Outside, the overcast March morning is warm and sunless but the production area seems spattered with blue, the bright, sky blue of Steelhead cans. A blue tower of newly filled cans, a sliver-topped array of empty ones, a long blue march of cans through the conveyor line. At each step, the portable canning line is at war with the air, fighting back against beer-degrading oxygen. First, four narrow tubes plunge into four cans, injecting carbon dioxide to displace the oxygen. Think of that as a little CO2 lake at the bottom of each can, Satrom says. Next, four wider tubes dive in, pouring the beer underneath the CO2, which floats upward as the can fills. Swiftly, before any significant oxygen can find its way back in, an overhead bar plops a lid loosely atop each can. 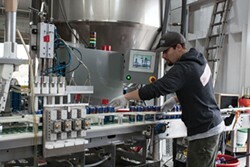 Then, beer foaming over their sides, the cans jiggle toward a rotating sealer. Within seconds, fresh beer is locked inside each dark, oxygen-limited can, safe from the ravages of light as well as air. 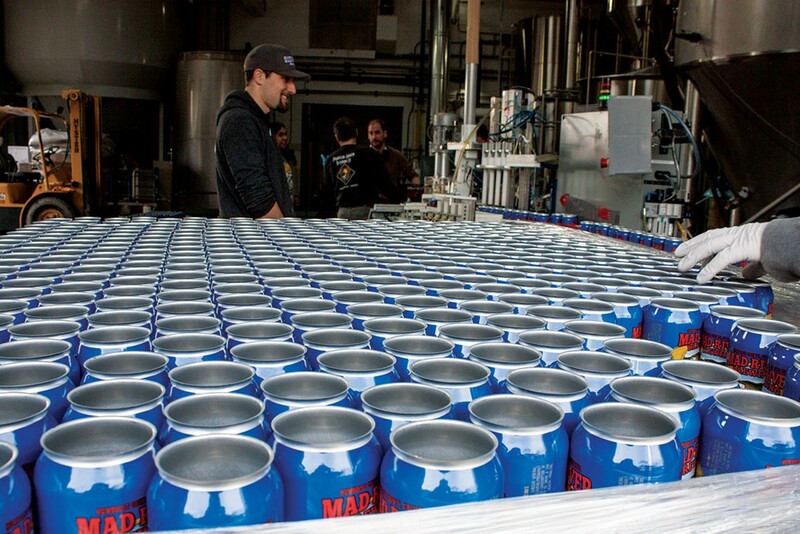 Mad River staffers clean the cans, snapping them into blue-lidded six packs, filling cases, stacking pallets. 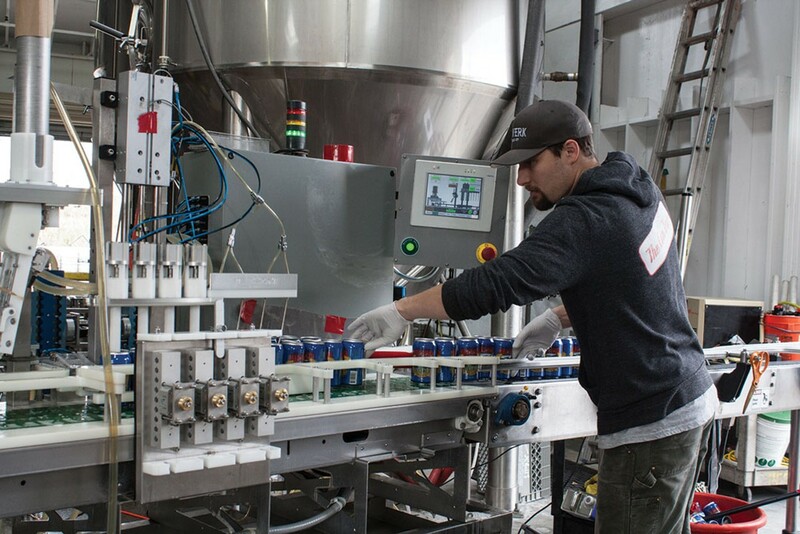 For Mad River, The Can Van has been an experiment, a way to test whether it makes sense to invest in its own canning line. So far, the answer is a provisional yes, says brewmaster Dylan Schatz. 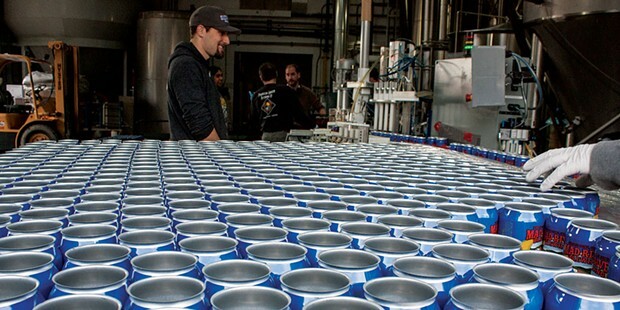 The same conclusion has already been reached by hundreds of craft brewers nationwide who have moved some or all their production into cans since the early 2000s. Why cans? They're lighter, easier to carry, allowed into glass-free venues, much cheaper to ship and generally — amid some debate — acknowledged to keep beer fresher longer. Why bottles? They are traditional, BPA-free, better at staying cold once chilled and — again, amid some debate — more environmentally friendly to manufacture. For Humboldt, 2017 is the year of the beer can. Mad River has been the pioneer, first bringing in a mobile crew last summer to can up Extra Pale Ale and Riverdays session IPA. It's considering adding Jamaica Red and other specialty beers to its can lineup once it gets its own equipment. Eel River Brewing and Lost Coast Brewery have both gotten their own canning lines in the past few months, with Eel River now ramping up canning of its California Blonde and Emerald Triangle IPA. Lost Coast plans to release four canned beers this summer: Great White, Tangerine Wheat, Watermelon Wheat and Fogcutter Double IPA. On a smaller scale, Redwood Curtain earlier this year rolled out the "crowler" a 32-ounce can that is filled behind the bar and sealed with a quick spin on the crowler tower. Herrema saw major manufacturers begin offering some BPA-free cans in late 2016, but they cost more and aren't warrantied as long as the cans with BPA linings. As far as she knows, none of her 50 or so beer canning customers are using them. "It's still kind of in development," Herrema said. "I think it's going to take a Coke or a Pepsi to put their foot down and put pressure on the can manufacturers." Saturday, April 1 – Discover cleverly crafted beer from dozens of home brewers using special recipes, local ingredients and curious twists. The Humboldt Homebrew Festival, from 2 to 8 p.m. at the Arcata Community Center, lets you talk with brewers, sample a rainbow of beer styles and benefit Engineers Without Borders, all in one afternoon. This can sell out, so buy tickets in advance from Wildberries, Humboldt Beer Works or brownpapertickets.com. $40. Early April – Six Rivers Brewery releases a kettle-soured wheat ale aged in oak barrels that once held Chardonnay. Friday, April 7 – Mad River Brewing Co. celebrates National Beer Day with an all-day happy hour. – Eel River Brewing celebrates National Beer Day and hoists a glass for an early Earth Day celebration with a party at its taproom, the release of this year's Earth Thirst organic double IPA, plus its own crowler "BigAss Cans" to go. Saturday, April 8 – Music, lawn games and food vendors join beer as the main attractions at Lost Coast Brewery's second annual Brewstraviganza from 2 to 6 p.m. Admission is free, or buy a $20 VIP ticket that includes drink tokens and snacks. Sunday, April 9 – Redwood Curtain's weeklong seventh anniversary celebration begins today and continues through April 15, with five new beer releases, barrel-aged and cellared specialties, and plenty of music. Wednesday, April 12 - Check out five beers from Ashland's Caldera Brewing Co., paired with a four-course meal during HumBrews' latest beer pairing dinner, starting at 6 p.m. Advance tickets $30; $40 at the door. Monday, April 17 – Dead Reckoning Tavern marks its second anniversary with a week of featured beer styles, running through April 22. Highlights include a Laguintas 420 tap takeover with Waldo and other Lagunitas favorites on Thursday, April 20. Saturday, April 22 – Celebrate Earth Day with a community seed exchange from 2 to 6 p.m. at Humboldt Regeneration Brewery in McKinleyville, where you can also learn about beer farming and taste a locally sourced gruit made with mushrooms. Saturday, May 6 – Details are still brewing but mark your calendar for Big Brew Day at Humboldt Beer Works plus Brew at the Zoo. Carrie Peyton Dahlberg is pretty sure bacon will kill her long before beer-can BPA can do its worst. Until then, you can reach her at beerstainednotebook@gmail.com.